From Game of Thrones to The Hobbit, medieval times have recaptured our imaginations. But, just how realistic are today’s portrayals? Seeking absolution of his sins, a lowly blacksmith trades in his hammer for a Crusader’s sword. The young daring warrior soon finds love, status, and adventure in the Holy Land. During the siege of Jerusalem, he goes against the prevailing cultural tide to gain respect for his Saracen enemies and embrace a vision for lasting peace between clashing cultures. At first glance, the plot of the 2005 movie The Kingdom of Heaven seems like a historical retelling of the life of Balian of Ibelin. Closer examination reveals, however, that the Balian of the film has more in common with swoon–worthy Hollywood idol Orlando Bloom who depicts him than the real–life royal who surrendered Jerusalem in 1187 to Saladin. Did director Ridley Scott ditch the facts to maximize the drama and romance? Should the film be interpreted not as a history lesson, but a plea for coexistence in a post–9/11 world plagued by centuries of conflict in the Middle East? In the course "Popular Medievalisms from the Holy Grail to Game of Thrones," UI students examine Kingdom of Heaven and other recent depictions of the Middle Ages to see what these re–imaginings reveal about our modern culture. As visiting assistant professor Joseph Rodriguez, 09MA, 12PhD, notes in his course syllabus, "The medieval is everywhere nowadays, it seems." And, he adds, "That says more about us than them." Students open their eyes to a world where, from the movie theater to the grocery aisle, dragons, castles, and damsels in distress abound. The Hobbit, a recently released film based on a book by medieval scholar J.R.R. Tolkien, is the 15th highest box office earner ever, while King Arthur brand flour subliminally aims to associate its product with the virtues of the legendary ruler’s court. Our nostalgia for the simpler, nobler time of the Middle Ages lives on—although the reality was dirtier, more brutal, and more deeply troubled than our idealized versions. In the "Popular Medievalisms" course, undergraduates look at silver screen favorites like A Knight’s Tale and Monty Python and the Holy Grail, as well as book series such as Cadfael and A Game of Thrones, to compare pop culture renditions to the realities of daily life in the Middle Ages. "When I’m playing a [medieval–inspired] video game, the objective is to have fun, not to ask if it’s realistic," says Kelson Lucas, a UI senior majoring in English. "But, I like being able to look at the period with a critical eye." As students place medieval texts alongside modern reverberations, they discover many perceptions of a time remembered both for its plague–ridden and scholarship–deprived Dark Ages and for the heroic and romantic ideals of Camelot and the Knights of the Round Table. 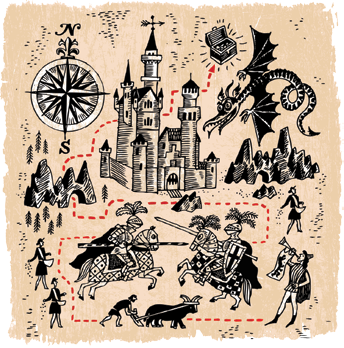 Other historical fantasies have gained traction in recent years, including Jane Austen’s England and the American Civil War, but more reincarnations of the Middle Ages exist than for any other time period in history. That’s likely because the era itself is hard to define, covering more than 1,000 years (from around 500 to 1500 A.D.), three continents, and many different cultures and socioeconomic classes. To complicate matters, our perspective has been colored by biased portrayals. As far back as Shakespeare’s time, artists and historians played loose with the facts. Rodriguez separates those facts from the fiction surrounding Richard III, the 15th century king whose remains were found this past February beneath a parking lot in Leicester, England. Shakespeare’s 1597 play, Richard III, portrays the king as a murderous villain so hideous that the very sight of him made dogs bark. The jury’s still out on whether the real Richard III killed his nephews to secure his place on the throne, but no evidence exists that he committed the host of other crimes Shakespeare ascribes to his name. Some historians view the play as a Tudor propaganda piece that legitimizes Elizabeth I’s rule at the expense of Richard III’s reputation. Similarly, Renaissance leaders defined the Middle Ages negatively to contrast the era with the Greco–Roman classical period they found so inspirational. Most of our scathing medieval stereotypes come from the Renaissance, which prided itself as a time when science and education triumphed over superstition and ignorance. In reality, scientific advances continued throughout the Middle Ages, leading to such inventions as eyeglasses, mechanical clocks, and the printing press. And, by medieval standards, a knight who spoke three languages but couldn’t read or write Latin would be considered illiterate. Still, the Middle Ages were largely a dark and dismal time characterized by war, disease, and restrictions on personal liberties. Such negative aspects haven’t stopped pop culture from creating romanticized versions. The legend of King Arthur and his heroic knights has inspired interpretations ranging from Mark Twain’s A Connecticut Yankee in King Arthur’s Court to Monty Python and the Holy Grail –swashbuckling tales ripe with swordfights, magical spells, and courtly love. Rodriguez says the ideals embodied by King Arthur’s Camelot may reveal a sense of discontentment with the present time and a longing for a chivalrous age "when men were men and maidens were maidens." Medieval–inspired fantasies like Robin Hood or Game of Thrones also appeal to students’ sense of adventure. "It’s tapping into the desire of possibilities that seem more stratified now with having to go through school and landing certain jobs first," says Lucas. "The sense of limitless possibilities makes the Middle Ages appealing to me." Catering to this penchant, rags–to–riches tales feature prominently in modern medieval media. The class analyzes A Knight’s Tale, a movie inspired by Geoffrey Chaucer’s 14th–century story collection Canterbury Tales. Starring the late Heath Ledger, it tells the story of a peasant who masquerades as a knight to gain riches and glory. Students may fantasize about the opportunity to reinvent themselves like the film’s protagonist, but such rises in social class were rare in medieval times. As Rodriguez explains, "If you said, ‘All men are created equal,’ the average medieval person would laugh in your face." Instead, the social classes consisted mainly of those who worked (peasants), fought (aristocrats), and prayed (monks). A disproportionate number of today’s medieval tales feed into the modern fantasy of living as a member of the royal family. "We imagine kings, princes, and nobles as having luxurious lifestyles that nobody now can aspire to," says Rodriguez. "It’s true that most people today don’t have servants or clothes dripping with gems, but the royals of the Middle Ages would trade in those luxuries for central air. It doesn’t matter if you’re rich or poor in the sweltering heat." Even Kingdom of Heaven feeds into the modern misconception that the Middle Ages offered common people the opportunity to rise through the ranks. Balian’s father, Godfrey of Ibelin, tells Bloom’s character, "You are not what you were born, but what you have it in yourself to be." This doesn’t sound like an adage of old, but a motivational pep talk of today. Indeed, students in the UI class notice a trend in medieval–inspired films for the protagonists to take a modern mindset, while antagonists remain entrenched in the "backward" thinking of their time. The theme recurs even in literature, such as Grendel by John Gardner, 57MA, 58PhD, (which paints the monster of Beowulf in a sympathetic light) and Catherine, Called Birdy by Karen Cushman (about a 13th century English feminist who dreams of Crusader adventures over wedding bells). As past views of the Middle Ages interact with the present, they create a new medieval history that is both rooted in fact and in the romanticism of what might have been. In an essay read by the UI students, University of Central Florida medieval expert Tison Pugh explains, "Medievalisms invite us both to explore and to ignore history, to create a magical Middle Ages reflective of our unique desires...."
Such magic happens at the Renaissance Faire, a smorgasbord of role–playing opportunities from jousting horsemen to bawdy buccaneers of the Caribbean. Faire– goers escape their everyday routines and the restrictions of contemporary society to become their fantasies—a noble knight, a powerful sorceress, a law–defying Merry Man. Anything is possible in the new, improved Middle Ages.